Our Hands-On-Tech - HOT - Reports take you through the top-spec connectivity features offered by manufacturers in detail and look to benchmark the connectivity functionality based on various test criteria. This month in our Hands-On-Tech (HOT) reporting series*, we put the 2018 Mitsubishi Outlander PHEV’s system to the test. Taking you through the top-spec connectivity features offered by manufacturers in detail, this HOT report series looks to benchmark the connectivity functionality of each manufacturer based on various test criteria. Its hybridised powertrain has put the Outlander PHEV some five years ahead of its peers, yet elements of the in-cabin connectivity—awkwardly called Smartphone Link Display Audio (no acronym)—feel like a throwback to the eighties, much like its name. This month in our Hands-On-Tech (HOT) reporting series*, we put the Skoda Connect system to the test. Taking you through the top-spec connectivity features offered by manufacturers in detail, this HOT report series looks to benchmark the connectivity functionality of each manufacturer based on various test criteria. Skoda’s J-segment crossover impresses with a stylish design and responsive features. Nissan’s Qashqai Pilot One Edition is this month’s test vehicle in our Hands-On-Tech (HOT ) reporting series. Taking you through the top-spec connectivity features offered by manufacturers in detail, this HOT report series looks to benchmark the connectivity functionality of each manufacturer based on various test criteria. Nissan’s attempts to leapfrog competitors to deliver a next-generation package that will future-proof its popularity and perhaps jobs in post-Brexit Britain have mixed results. This month in our Hands-On-Tech (HOT) reporting series*, we put the Honda HFT system to the test. Taking you through the top-spec connectivity features offered by manufacturers in detail, this HOT report series looks to benchmark the connectivity functionality of each manufacturer based on various test criteria. Honda concede that in-car connectivity hasn’t been its focus, and while some features hit the mark, others miss it by a good mile. This month in our Hands-On-Tech (HOT) reporting series, we put Korean manufacturer SsangYong's system to the test*. Taking you through the top-spec connectivity features offered by manufacturers in detail, this HOT report series looks to benchmark the connectivity functionality of each manufacturer based on various test criteria. This month in our Hands-On-Tech (HOT) reporting series, we put the Hyundai KONA’s Blue Link system to the test. Taking you through the top-spec connectivity features offered by manufacturers in detail, this HOT report series looks to benchmark the connectivity functionality of each manufacturer based on various test criteria. Hyundai has done a good job to position its technology with what the market is currently expecting. Yet, in this fast changing world, it is a system that will date very quickly. Next in our Hands-On-Tech reporting series, we take a look at Ford’s SYNC 3 system. Taking you through the top-spec connectivity features offered by manufacturers in detail, this HOT report series looks to benchmark the connectivity functionality of each manufacturer based on various test criteria. Onto the third iteration of the SYNC system, Ford is going from strength to strength. This is our Hands-On-Tech (HOT) reporting series*. Here, we take a look at the top-spec connectivity features offered by manufacturers in detail, looking to benchmark the connectivity functionality based on various test criteria. Volkswagen’s compact crossover T-Roc takes on the best-selling Nissan Qashqai in a very busy and fiercely competitive segment. So how does the technology, Car-Net, now available across the range, fare as a value proposition? This is our Hands-On-Tech (HOT) reporting series*. Here, we take a look at the top-spec connectivity features offered by manufacturers in detail, looking to benchmark the connectivity functionality based on various test criteria. The Jeep Compass is fast becoming a global best-seller, biting at the heels of its rivals in almost every key market including the US, India and Europe. But is all this glory a little misplaced? Performance-wise, not one jot. But if Jeep want this love affair to last forever, they need to make some major tweaks. Seventh in our Hands-On-Tech (HOT) reporting series, we take a look at Vauxhall’s Intellilink system. Taking you through the top-spec connectivity features offered by manufacturers in detail, we look to benchmark the connectivity functionality based on various test criteria. Available in Europe since October 2015, the Astra features GM’s Intellilink system and award-winning Onstar telematics service, where humans assist rather than automated messenger. Sixth in our Hands-On-Tech (HOT) reporting series, we take a look at the Peugeot 3008’s i-Cockpit technology. Taking you through the top-spec connectivity features offered by manufacturers in detail, we look to benchmark the connectivity functionality based on various test criteria. Having won European Car of the Year 2017, the Peugeot 3008 set a high expectation. Where technology was concerned, however, it offers more style than substance. Welcome to the fourth feature in our newest reporting series. Our Hands-On Tech, or HOT, Reports take you through the top-spec connectivity features offered by manufacturers in detail and look to benchmark the connectivity functionality based on various test criteria. This month we take a closer look at the BMW 5-series. With more functionality than any other car we have tested to-date, BMW is definitely moving in the right direction in aligning a great connected user experience and safe driving. Welcome to the third feature in our newest reporting series*. Our Hands-On Tech, or HOT, Reports take you through the top-spec connectivity features offered by manufacturers in detail and look to benchmark the connectivity functionality based on various test criteria. This month we take a closer look at the Kia Rio, with a grade 3 trim spec. It’s the first car in our series to feature Apple CarPlay and Android Auto, so we’ve also included an in-depth review of these applications. Welcome to the second feature in our newest reporting series*. Our Hands-On Tech - HOT - Reports take you through the top-spec connectivity features offered by manufacturers in detail and look to benchmark the connectivity functionality based on various test criteria. This month we take a closer look at the groundbreaking system in the Tesla Model S. As the only manufacturer offering over-the-air (OTA) updates to each one of its vehicles, regardless of the date of purchase, Tesla’s unique approach in the world of connected vehicle technologies sets it apart from the rest. Welcome to the first in our newest reporting series*. Our Hands-On Tech, or HOT, Reports take you through the top-spec connectivity features offered by manufacturers in detail and look to benchmark the functionality based on various test criteria. 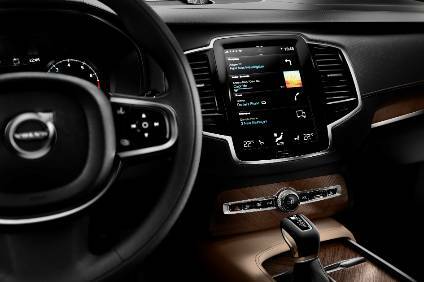 First to be tested, the award-winning Volvo Sensus system, as currently featured in the XC90, XC60 and brand-new XC40, Volvo's first compact SUV.